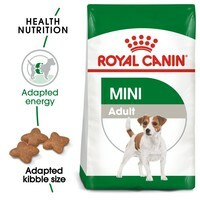 Royal Canin Mini Adult is a complete diet for small breed dogs over the age of 10months. Developed to meet the nutritional needs of small breed dogs, the food has been made with only high quality ingredients including vitamins and minerals. Suitable for small breed dogs over the age of 10 months and with an adult weight up to 10kg. Maintains Idea Weight: Helps maintain ideal weight in small breed dogs by perfectly meeting their high energy needs and promoting fat metabolism by L-carnitine. Coat Condition: The formula contains nutrients that help support a healthy skin and coat. Enriched with EPA-DHA. I use this product with wet food and my dachshund loves it. Dachshunds are prone to teeth problems and by giving them half wet and half dry is the best solution for my dog who eats the biscuits last and so they clean her teeth. After trying several brands, my dog finally found his favourite! He seems to love the flavour!